There is only one Royal Castle Restaurant left from the Miami chain. It’s located at 2700 NW 79th Street and still opens 24 hours a day. Royal Castle was founded by William Singer in 1938 way before Burger King opened up its first Miami outpost in 1954. It was the original Miami Chain. 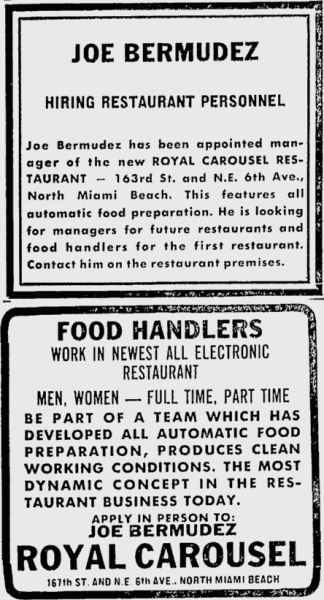 A few months later in July of 1967, an ad appeared in the Miami News looking for “Restaurant Personal” and Managers for future locations. The address for this location was *599 NE 167th Street in North Miami Beach, it’s now a Taco Bell. The Miami Times and The Miami News both ran stories about the opening of Royal Carousel in August of 1967. 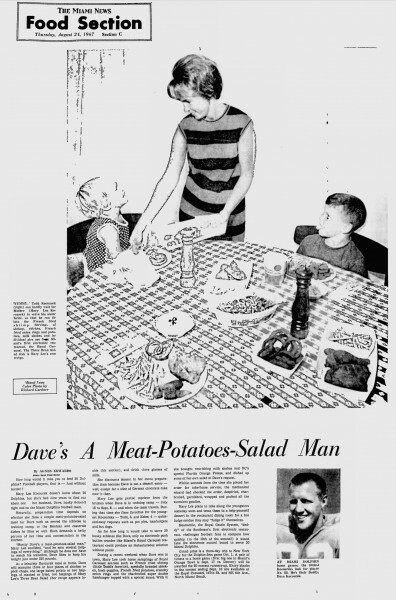 It was touted as the first Electronic Restaurant in the Southeast. 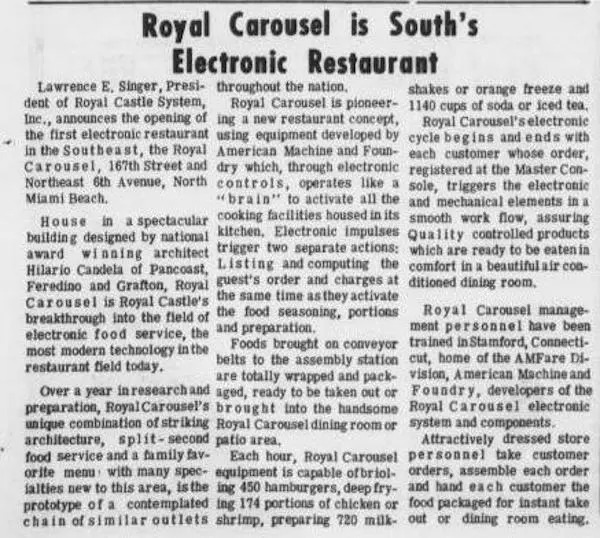 The idea was that you come in, place your order at a Master Console (as the Miami Times called it) and then it would be cooked and packaged by the Royal Carousel machinery. The food deviated from the Royal Castle menu with items like French Fried Shrimp, Specially Breaded Chicken, & Hush Puppies. I found it most interesting that they served a “Charbroiled Super Double Hamburger with Special Sauce” since Royal Castle cooked their Sliders on a flat top. I also noticed the mention of the air-conditioned dining room which was not the norm for fast food in that era. I can not find any evidence to support how long Royal Carousel lasted or if it even expanded past the original location in North Miami. It seemed like a great idea that didn’t pan out. If you’ve got anything you may remember about Royal Carousel please leave a comment below, I’d love to hear about it. Did you say Beast #1 like the Iron Sheik? I lived in Miami (South Florida) up until 1985. I never saw the Royal Carousel at all. 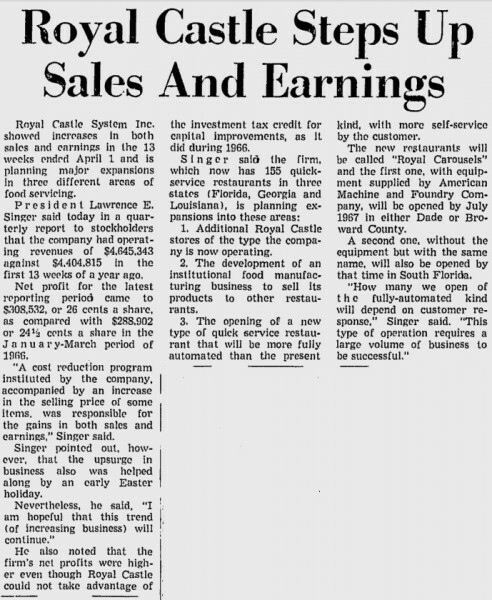 When I was a teenager I worked at the Royal Castle on BIscayne Blvd and 86th street across from the Bid Daddy’s Bar. Was it an enjoyable experience? I lived across the street from the Royal carousel behind where Krispy Kreme is now. I remember eating at carousel several times and it was enjoyable. It seems like when the tornado hit the area the building was damage and they decided not to reopen. Thanks for the info. I haven’t been able to find any information about why it closed down. Do you have any pictures of the Royal Carousel please post here. The Royal Carousel didn’t last long ’60s (See Stephen LeQuier’s comment below). After it closed, Chicken Unlimited moved in. Chicken Unlimited was in that building throughout the 70s and 80s. They closed up in the 90s. 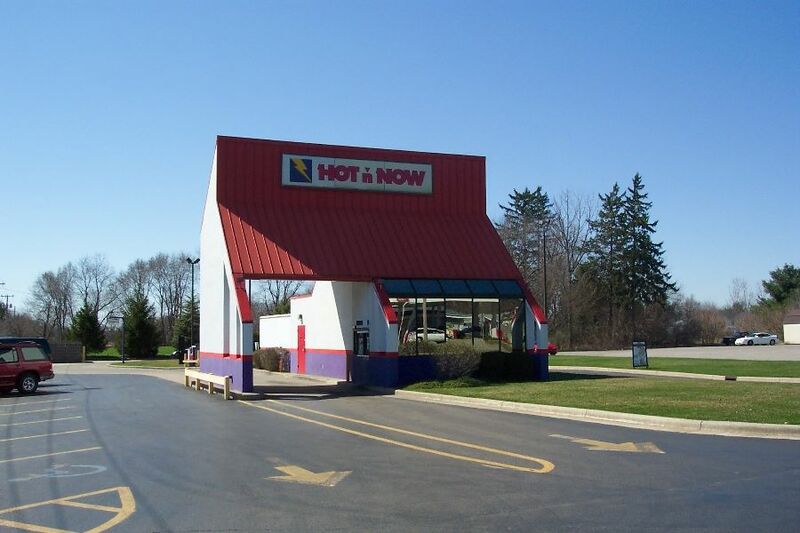 The old circular (carousel) building was torn down and the new Taco Bell building was erected. Born in N. Miami Beach 1958, I lived at 10th Ave and 171 terr. I remember my dad taking me to the Royal Carousel on 6th Ave when it opened. It was in the S.E. corner of the grocery store parking lot my mother shopped at. It was fantastic watching the conveyers start up when you placed your order. I always went across the street to the 7 11 for an Ice afterward and my dad picked up Krispy Kreme donuts across to the south. Great memories. Thanks for writing about it. I’ve been searching for places I went as a kid and hadn’t found anything before your blog on this joint zee. The location closed in under a year. It just was ahead of its time I think.